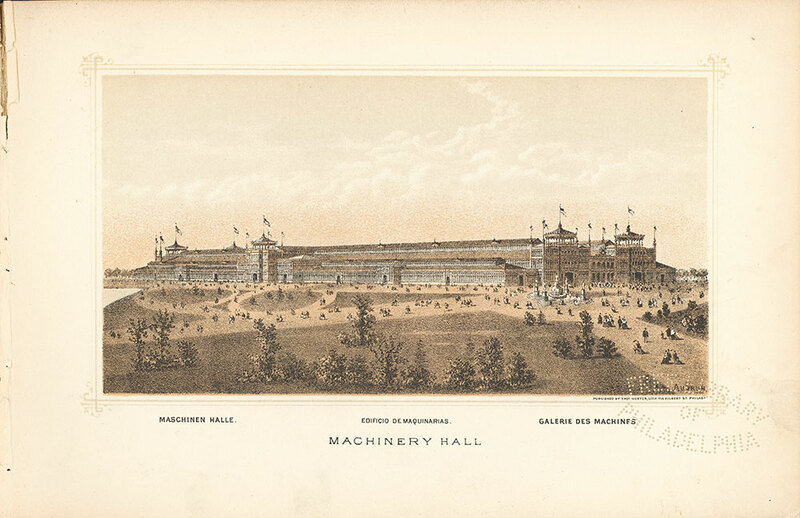 Notes: "Length 1402 ft. width 360 ft."
Notes: "Machinen Halle, Galerie des machines." In general appearance at a distance resembles the Main Exhibition Building, but the architectural details are quite different. The structure is located about 550 feet west of the Main Exhibition Building, its north front being upon the same line, so that, viewed from the interior of the grounds, this building appears to be a continuation of the other. This structure is 1402 feet long, 360 feet wide, with an annex extending from the centre 210 feet in depth to Elm avenue, this extra space being 208 feet wide. There are also 2 other annexes and 4 boiler-houses, with some small buildings. There are two main avenues, each 90 feet wide, with a central aisle between them, 60 feet in width. Two aisles, each 60 feet wide, one on the north and one on the south side, finish out the ground-plan. Taking off from the interior the front constructions and galleries, these aisles are each 1360 feet long. In the centre is a transept 90 feet wide, extending from north to south, and widening on the south line of the main building to 208 feet. The chief portion of this edifice is one story in height, the main cornice on the outside being 40 feet from the ground. The interior height to the top of the elevator, from the avenues, is 70 feet; in the aisles it is 40 feet. The foundations are piers of masonry, upon which are erected solid timber columns, which stand in rows 16 feet apart. The columns are 40 feet high, and support the 90-feet roof-spans and 60-feet roof-spans at the aisles. The outer walls are built of masonry to the height of 5 feet, above which are glazed sash in connection with the columns. These windows are movable for ventilation, and there are Louvre ventilators along the avenues and aisles. The light is from the north and south. The annex fitted up for hydraulic machines has a tank 60 x 160 feet, with 10 feet depth of water. The interior is handsomely decorated in light colors, the pillars, ties, struts and roof being painted with taste, so as to create an agreeable effect. The exterior is diversified in the long lines by façades and projections at the main entrances, which extend 78 feet in height and are ornamented with arches and towers. In the centre there is a façade and tower with projecting wings. East and west of the centre, about halfway between that portion of the building and the ends, are other projections. There are eight entrances upon the sides, four of which, with doorways and ornaments, help to break up the uniformity. From these doorways walks lead across the building, 10 feet wide. The promenades in the avenues are 15 feet wide; in the aisles, 10 feet wide; and in the transept, 25 feet wide. The entire area is 558,440 square feet, or nearly 13 acres, and with the gallery space the available area is nearly 14 acres. The architects are Henry Pettit and Joseph M. Wilson; the builder, Philip Quigley, of Wilmington, Del. Cost of the building, $792,000. This building was constructed entirely at the cost of the city of Philadelphia, and will permanently remain on the grounds after the Exhibition is closed.